In 1866, the first match was organised between the cities of Klaipeda (a Lithuanian seaport) and Hannover (Germany). It was played to the best of four games. The second correspondence chess competition took place in 1888, and it was a commercial match between Vilnius and Voronezh (Russia). There were four players per team: J. Levis, S. Matedzis, M. Prozorovas and O. Rukas representing Lithuania, and A. Veber, D. Gravirovskij, I. Kalinskij and G. Karenovskij representing Russia. The two games were played in consultation, with the final result of 1.5–0.5, Voronezh was the winner. Vilnius had to pay 25 roubles -a lot of money at that time! In 1959-1960 the first Baltic countries championship was organised for Lithuania-Latvia-Estonia (30 boards). The Lithuanian CCF became a member of ICCF in 1992 at the Congress held in Graz (Austria). On 1st February, 1996, the Lithuanian CCF was registered in the Ministry of Justice. Before that time, LCCF was part of the Lithuanian Chess Federation (OTB). Lithuania had two remarkable results in team events: it won the European Cup (1966-1971) with 65.5 points, ahead of Moscow (61.5), Estonia (53.5), West Germany (52.5), East Germany (47), Hungary (54), Russia (44.5), Latvia (33.5) and Belgium (28.5). The Lithuanian team was: V. Mikenas, I. Vistaneckis, J. Krimeris, D. Lapienis, A Uogele, G. Plunge, G. Lakiunas, M. Kozlovas, J. Butkus, L. Kalvelis, V. Milvydas, and A. Vladimirovas. Lithuania also won the Soviet Union team championship (1982-1984) with 131 points, ahead of Russia (130.5), Azerbaijan (129.5), Estonia (123.5), Latvia (118.5), Ukraine (116), Moscow (114), Leningrad (107.5), Byelorussia (103), Kazakhstan (93.5), Uzbekistan (89), Armenia (80), Tadjikistan (70), Moldova (69), Kirghizia (63), Turkmenia (50.5) and Georgia (42). The team members were A. Uogele, V. Gefenas, V. Nomantas, R. Sutkus, E. Slekys, R. Klimavicius, J. Butkus, A. Mikenas, V. Sutkus, A. Kupšys, F. Dobrovolskyte, and J. Blinkeviciuté. In individual CC events, many Lithuanians have won European CC Championship: Anicetas Uogele, Vladas Gefenas, Gediminas Rastenis, Ricardas Zitkus, Valentinas Normantas, and Alius Mikenas. Donatas Lapienis was the highest rated player in the World during the period 1989-1991, and he won the tournament “100 Years of the Polish Chess Union”. 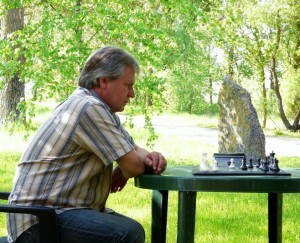 He was the first Lithuanian CC Grandmaster. Borisas Rumiancevas won the “Vilnius-100” international Tournament (1988-1993) gaining the GM title. Second was Piet Seewald (NLD) and third was Robertas Sutkus (LIT). V. Andriulaitis became a GM in the Reg Gillman Memorial B tournament. Anicetas Uogele was winner of the first three Lithuanian CC championships. Finally, Lithuania is also known for its famous emigrant representatives. Romanas Arlauskas was an ICCF Grandmaster, born in Kaunas in 1917. In the year 1944 he migrated to Germany, and later (1948) to Australia. Vytas Palciauskas was the winner of the 10th World Championship Final and is also an ICCF Grandmaster. He was born in 1941 in Kaunas, but in 1945 his family emigrated to Germany and in 1949 to USA, where he now resides with his wife Aurelia. Lithuanian achievements in modern times were mostly reached in team competitions. Lithuanian ladies won the 6th Ladies Olympiad. The team members were Dambrauskaite Vilma, Kveinys Vineta, Mylašiute Vygante and Potapova Jelizaveta. In the 7th LOLY Lithuania was second behind Slovenia the team members were Dambrauskaite Jurgita, Potapova Jelizaveta, Kveinys Vineta and Dambrauskaite Vilma. Lithuania was also second in the 14th Olympiad the team members were Andriulaitis Vytautas, Kupšys Alfonsas, Rocius Marijonas, Zagorskis Darius, Novikovas Vitalijus and Grabliauskas Virginijus. Lithuania was also second in the 6th European team championship. The team members were Andriulaitis Vytautas, Grabliauskas Virginijus, Kupšys Alfonsas, Rubinas Pavel, Rocius Marijonas, Zagorskis Darius, Bandza Algirdas, Novikovas Vitalijus, Petraitis Gintautas (he was substituted by Minelga Dainius), Dambrauskas Virginijus, Rupšys Rimantas and Rauduve Algirdas (he was substituted by Godlauskas Kazys). Lithuania lately organized two strong invitaniotal tournaments: 1000 years to Lithuania (the winner was Rubinas Pavel gaining GM title) and Robertas Sutkus Memorial (the second place winner was Sutkus Vytautas, the brother of the Robertas). Many Lithuanian players gained GM and IM titles in the past few years. GM title was gained by Rubinas Pavel, Petraitis Gintautas, Grabliauskas Virginijus, Kupšys Alfonsas. IM title was gained by Minelga Dainius, Chocenka Dmitrijus, Pakenas Povilas, Sutkus Vytautas.